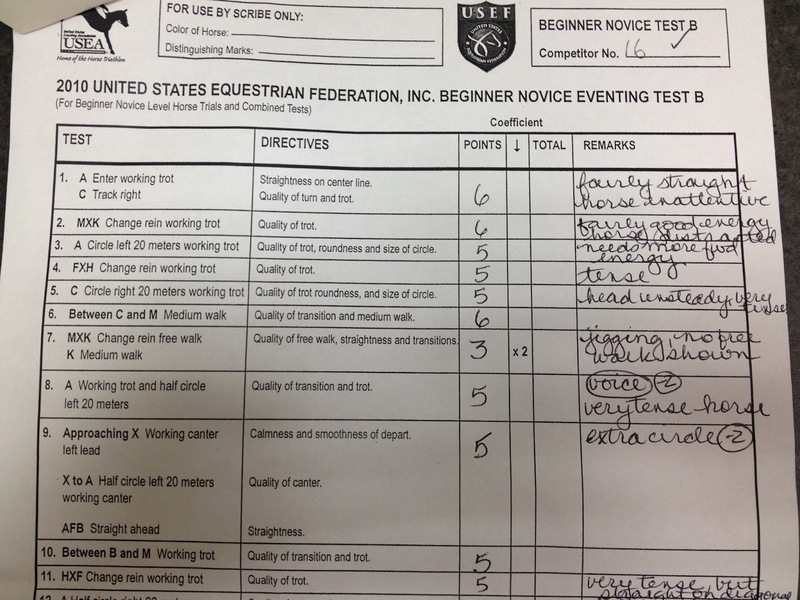 Actually, it went in reverse order: Ugly dressage warm up, Bad dressage test, then Good jumping. At least it got better as the day went on. Firstly, gotta give credit where credit is due. I want to thank my husband for his amazing support. He was a doting horse show hubby. Many thanks to my trainer Laurie for being so encouraging. Tammy and Randee and The Meadows of Moorpark team did a great job putting on the show, and special gratitude to Sarah B. and the other volunteers who make schooling shows possible. And finally, thanks to my cheering section: my mom Barbara, brother Danny, neice Marlie, nephew Bobby, and friends Karla, Andy, Jess, and Jenna. It was nice to see everyone and I appreciate the warm vibes. Sunday morning was bright and cheerful. I was packed and ready to roll. Hemie munched breakfast while getting groomed up. I took him for a longe and he was very well behaved and not super frisky. I was tired from the previous day’s ride (and fall) and thought perhaps he was too. I was wrong. He was perfect for loading up, for unloading, and for grooming. He was calm walking around, I hopped on him with plenty of time to warm up. We headed out to the open warm up area near the dressage courts. And then my horse started freaking out. He did not want to move forwards, especially when headed away from the main entrance area. He slid backwards, scooted sideways, and got light up front. I tried putting him to work, but he almost careened into people and horses, so then I focused on getting him to a more open, less populated corner of the warm up area. Once there, I focused on just FORWARD, praising every step forward and trying not to pull on his mouth – afraid of making him go up (or over). Yep, I was that girl in the warm up. The one you cringe at, while thinking “she needs to get a handle on her horse!” while simultaneously moving away and shielding any small children with your body. I struggled for what seemed like an eternity. I probably nearly killed at least 6 people. It was mortifying. Finally, someone had the kindness to help me out. That person was well-known So Cal eventer Susan Friend LeTourneur of Goldspirit Farm, who now has a special place in my heart. She gave me some encouragement, and more importantly, a specific exercise which worked to fix the issue. She had me over-flex to the side, then move into a 10 meter circle, focusing on getting the hind feet to move forwards. Have solid rein contact, sit deep on the seat, really driving forwards with the hips. From there, move straight out from the circle. Switch directions if the problem arises again. Pretty soon you’ll have larger circles, then figure eights, then you’re like a normal person in the warm up. She even threw in a few coach-like, empowering words, which helped my brain to click back into gear. Thank you, Susan – you earned a new friend and supporter today! Moving on to our actual dressage test. The best I can really say about it is that…it could have been worse. We did stay inside the arena at all times, and we didn’t get eliminated. But to be honest I am very disappointed. I think we could have done much better had I been a more effective rider in the warm up sooner, and a more positive rider during the test. But, c’est la vie. 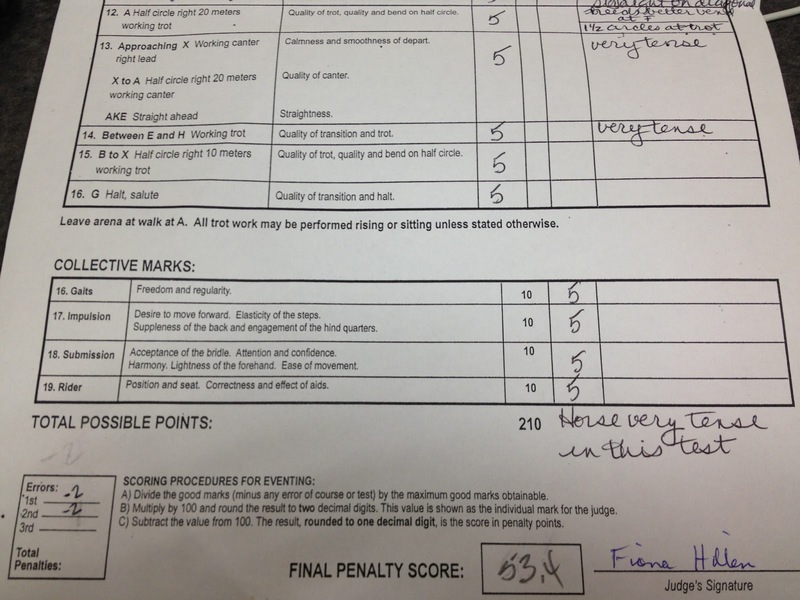 The judge was actually quite generous – she gave us lots of 5s for what really should have been 3 or 4s. Here’s the video. Brace yourself – it’s painful. Both of us look tense and why, oh why, didn’t I bend my elbows and squeeze the outside rein more! Seriously people I’m not normally this bad of a rider. So frustrating! I went off course twice in the test, but because she didn’t ring the buzzer the first time she did not dock me points the second time. Specifically, I added an extra trot circle before picking up the canter each direction. I also got some points off for clucking to him during the test. I could feel him getting stuck and felt I needed to do it in order to help him move forward. I already knew we were scoring horribly anyway, so I just wanted to give him as good an experience as I could at that point. 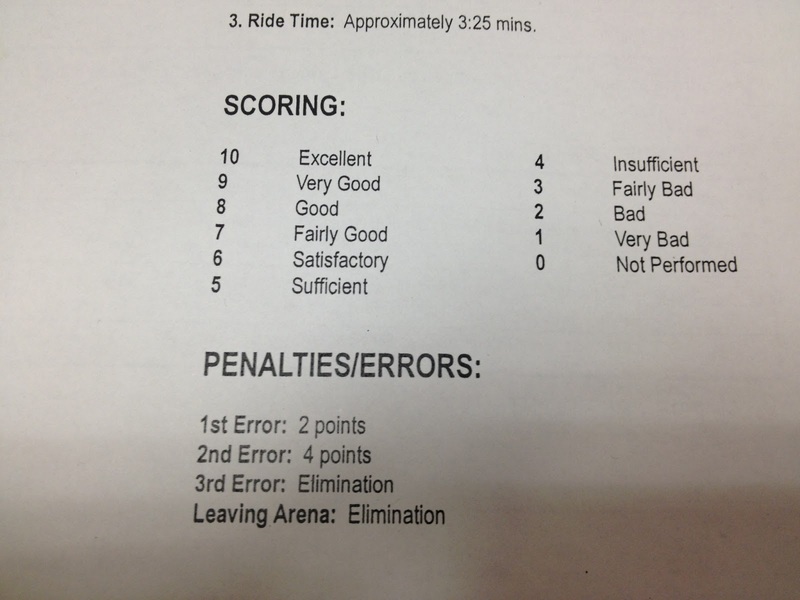 Here are the scores and comments. Alright, time to do some de-stressing. Next post will cover the jumping part, ending on a much more positive note. The warm up advice was great. That sounds like the exercise I do with Sydney. When he's really tense, I plant my inside hand on my thigh and circle, always trying to move his hindquarters out. If I feel him soften, I increase the size of the circle. If he tenses back up, I put my hand back on my thigh and make the circle smaller again. He has learned that this is a safe place to be. It's not meant as a punishment, but rather as an “I can do this without worrying” exercise. That's rough, but think of the bright side. You improved, and you made it through! He'll be better next time for the experience. Hey, you made it in to the arena. ;) That's positive.